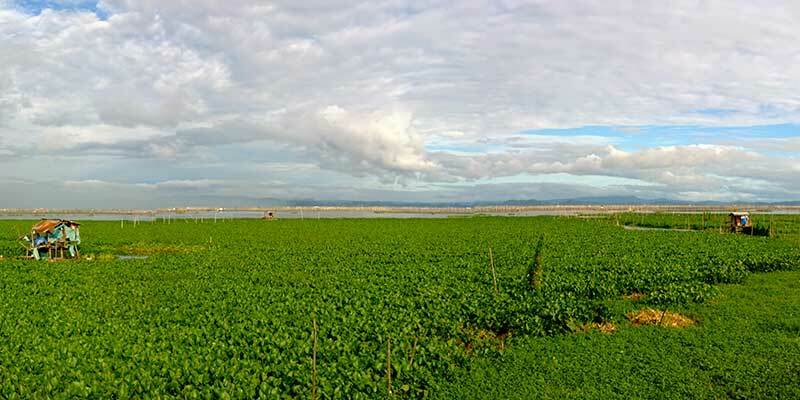 High levels of nutrients in Laguna de Bay near Manila are responsible for an overgrowth of water hyacinths and a depletion of oxygen levels in the water. The Republic of the Philippines, which comprises more than 7,000 islands, has the fifth longest coastline of any nation in the world at more than 36,000 miles. But with increasing development, population, and tourism, water quality has become a problem that threatens industry, the environment, and public health alike. In 1996, monitoring of Philippine rivers showed 49% had substandard water quality. In response to the nation’s water problems, the Republic of the Philippines embarked on a program of regulation that has evolved over the years. In 2004, the Philippine Clean Water Act (No. 9275) established water quality management in all water bodies, along with a mandate for the development of wastewater reuse standards for irrigation and fertilizer production. The Department of Environment and Natural Resources (DENR) has more recently updated the Republic’s water regulations with 2016’s Administrative Order DAO 2016-08. The act establishes a water body classification rubric, new water quality standards, and general effluent standards. Before the 2004 Act, with 48% of the Republic’s water quality problems tied to untreated sewage, only 3% of water infrastructure investment was going toward sanitation and sewage treatment. The World Bank rated Manila second-lowest among Asian cities for sewer connections at only 7%; the nationwide figure was only 5%. Water contamination was blamed for 31% of all sickness in the country. Currently, the largest source of water pollution is domestic wastewater or sewage, and only 10% of wastewater is treated. An estimated 4,200 Philippine citizens die annually from causes associated with contaminated water, and economic losses from inadequate sanitation are estimated at 78 billion Philippine pesos (about US$1.5 billion) annually. The 2016 DENR standards introduced new parameters and controls on the nutrients ammonia-N (NH3-N), nitrate-N (NO3-N), and phosphorus (as phosphates) to combat crises such as the one experienced in Laguna de Bay, the largest lake in the Philippines, which lies next to Manila. Eutrophication, the overgrowth of plants and algae from excess nutrients in water, has clogged Laguna de Bay’s waters with hyacinth and damaged the lake’s main industry, fishing. The nutrients, including nitrogen and phosphorus, are effective fertilizers for vegetative growth, but when populations swell without matching growth in wastewater treatment infrastructure, excessive growth of hyacinths and other aquatic plants limits light and strips the water of dissolved oxygen that fish and other aquatic organisms need to survive. Algal blooms encouraged by eutrophication can be toxic. Since Laguna de Bay supplies a third of Manila’s fish, eutrophication is a serious problem. Fortunately, new technologies are widening the viability of biological nutrient removal (BNR). BNR is acknowledged as the best solution for nutrient removal, and a new, disruptive form of the technology called the membrane aerated biofilm reactor (MABR) has slashed the high energy requirements of the older, activated sludge process by eliminating costly air compression. The advanced membrane process produces larger volumes of high-quality effluent on a smaller footprint, and is ideal for decentralized treatment. The technology could prove ideal for the Philippines’ water woes. MABR is provided in Smart Packaged Aspiral™ units for maximum flexibility and scalability. Aspiral units, which are packaged in standard shipping units, can be located at strategic points directly adjacent to need and supply, avoiding costly pipelining, not to mention the political headaches associated with new centralized infrastructure. The units are efficient enough to be used with alternative energy sources, and are neighborhood-friendly due to their low-odor-low noise operation. The Philippines’ new regulatory framework and the actions taken signal that the nation has now started on a journey toward a healthy water future, and technology is keeping pace.